Alternatively, you may be looking for how much it costs to ride a hot air balloon, which is much more affordable. Buying a hot air balloon and becoming a hot air balloon pilot will put you in rare company. There are only about 4,000 hot air balloonists in the United States. Hot air ballooning is regulated by the Federal Aviation Administration (FAA), and all pilots and balloons must meet their regulatory standards. New balloons are expensive (think luxury car prices) and must pass annual and 100-hour inspections. In addition to the balloon, pilots must invest in additional equipment, ground crews, and insurance. Still interested? Start by getting your pilot’s license. There are two kinds of pilots’ licenses available: private and commercial. A private license allows you to fly solo in a balloon, a commercial license allows you to take people on rides in a balloon (all commercial pilots must hold a private pilot’s license). The requirements for each license are outlined by the Federal Aviation Regulation (FAR) Part 141. Training for a private license requires at least ten hours of flight instruction combined with additional hours of ground training and a written test. A commercial license requires more experience- pilots must have at least thirty-five hours of flight time with additional ground experience and must pass a much more stringent written test. There are a number of FAA-approved flight schools that offer training courses for a private or commercial license. Schools will help you log hours of ground and flight training and some offer additional study materials to help you pass the written test. At a minimum the schools’ training programs must meet the FAR’s requirements, many offer more extensive programs that include more training time. Rates for pilot training vary depending on the license you want and whether or not you will use your own balloon or the school’s during your training (cheaper rates apply if you use your own). The costs for training for a private license can range from $1,200 to $2,750, a commercial license can cost anywhere from $1,500 to $3,500. So, how much will buying your own balloon set you back? Balloons are expensive and range in size and purpose. When buying a balloon, keep in mind you are buying a “flight system” that consists of the balloon (also called the envelope), the basket or gondola, fuel, burners and an inflation fan that is used to help inflate the envelope. Costs of these items can vary and some of them are included when you purchase a balloon. Others you will have to buy on your own, such as fuel for each flight (from $15 to $30 and up per hour) and the inflation fan ($900 and up). Additionally, comprehensive insurance will cost anywhere from $500 to $1,200 annually. You will also need a chaser crew on hand when you fly. Chaser crews are ground-based crew members who help balloonists inflate and deflate the balloon and assist with landings. Because each flight is unique—pilots fly with the wind currents on flight day—pilots don’t know where they will land until they are in flight and need a chaser crew to follow their fight in van or other such vehicle on the streets below. 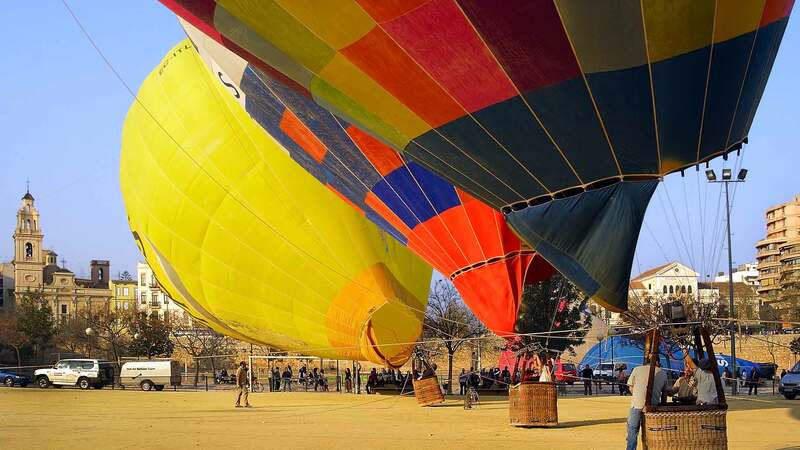 During the flight, members of the chaser crew keep in contact with the pilot via two-way radio and ultimately meet them at the flight’s landing spot, where they help pack up the balloon and bring the pilot and any passengers back to where they started from. Sometimes members of chaser crews will volunteer to work in exchange for flight training, see the “Still not sure?” section below. Smaller or sport-sized balloons are for solo flights (pilot only) can start at $20,000. Larger balloons for commercial flights, where pilots are hired to take people on rides, can start at $45,000 and can go much higher, depending on how large the balloon is and how many people the basket can hold. Many businesses also create customized balloons for promotional events and these prices can range greatly depending on the size, shape, and complexity of the balloon’s design. You can also buy a used balloon, prices start at as little as $5,000 but can range from $11,000 and up. All balloons must meet FAA safety regulations and are required to have a certificate of airworthiness. Balloons must undergo annual and 100-hour inspections, fees vary for this inspection, a good ballpark cost for inspections is $350. They must also undergo regular maintenance to ensure safety on rides. Maintenance and repair work should be performed by an FAA-certified shop to ensure the balloon will continue to meet regulatory standards. If properly maintained, a new balloon will last anywhere from 300-500 hours before it needs to be replaced or significantly repaired. If you aren’t sure you want to invest in pilot training or buying your own balloon, a good way to see if you’re truly interested in pursuing your training is to volunteer as a chaser crew member. Some schools and pilots are willing to barter training classes in exchange for crew work. Apart from enrolling in a formal class, this may be the best way to get first-hand experience in what’s involved in piloting a hot air balloon. Research local schools in your area to see if this type of arrangement is possible.